Inamuragasaki (稲村ヶ崎) is a peninsula or cape in Kamakura. 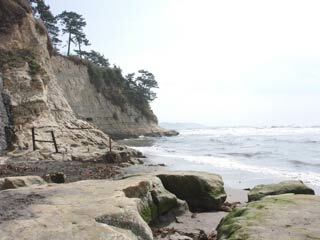 It is located on the western side of Yuigahama beach. The ancient Tokaido road leading fro mKyoto to Edo passed along the coast south of Inamuragasaki. During the Kamakura period it was an impassable natural defence which made Kamakura an impregnable fortress. Inamuragasaki appears often in historical records and was first mentioned in the Genpei Josuiki when it was crossed by the Miura clan twice in 1180 on their way to aid Minamoto no Yoritomo at the battle of Ishibashiyama. The Miura troops were too late to help out leaving Yoritomo to fend for himself with an outnumbered army. Yoritomo was defeated and the Miura clan retreated back across Inamuragasaki. Inamuragasaki is also mentioned in the famous Heike Monogatari and the Taiheiki. Inamuragasaki is most famous for it's role in the battle of Kamakura in 1333 when Nitta Yoshisada was able to skirt the cape to land on the beach and invade Kamakura, bringing the Kamakura government to an end. For it's importance in this decisive battle, it is a recognised historic site has by the Japanese government.